This ground-breaking title from IACCM (International Association for Contract and Commercial Management) is the definitive source for practical business solutions to vexing contract problems. Contracts are the language of business, and this book gives readers the essentials that can make a difference to any deal, no matter how big or small. Designed for the non-contract manager, this book takes project managers and other professionals through the basic process and gives them a road map to improved results, increased value, and successful outcomes. In this book you’ll find sensible guidance and approaches to ensure business success. Case studies showing you what can go wrong – and what can go right -- bring theory into the real world. Checklists give confidence and enable you to be certain that you have asked and answered the right questions as you go through any deal. This real-world approach demonstrates the value of effective contracting. This is not dry, academic prose. It is compelling and dynamic advice and tools to manage business relationships for both buyers and sellers. Almost 80% of CEOs say that their organization must get better at managing external relationships. According to The Economist, one of the major reasons why so many relationships end in disappointment is that most organizations 'are not very good at contracting'. Packed with more than 600 pages of practical advice and insights, this ground-breaking title from leading authority IACCM (International Association for Contract and Commercial Management) represents the collective wisdom and experience of Contract, Legal and Commercial experts from some of the world's leading companies to define how to partner for performance. This practical guidance is designed to support practitioners through the contract lifecycle and to give both 'supply' and 'buy' perspectives, leading to a more consistent approach and language that supports greater efficiency and effectiveness. Within the five phases described in this book (Initiate, Bid, Development, Negotiate and Manage), readers will find invaluable guidance on the whole lifecycle with insights to finance, law and negotiation, together with dispute resolution, change control and risk management. This title is the official IACCM operational guidance and fully supports and aligns with the course modules for Certification. EUR€78 / USD$67 (approx) Electronic version of IACCM's acclaimed Operational Guide for contract and commercial management. An in-depth handbook for the general counsel looking to build a truly modern legal department and revolutionize their role. The contemporary legal landscape is no longer a rigid hierarchy composed of limited and complacent behemoths, but rather an ecosystem, filled with a wide variety of players that facilitate disruption and revolution and jostle for clients’ attention with agility and innovation. This includes – but is certainly not limited to – entities such as technology companies, consultants, alternative legal service providers, and paraprofessionals. Law firms are not the only ones in this environment that must adapt or fail; the legal department and in-house counsel, too, must transform in order to remain relevant and competitive. The world of the general counsel (GC) has already seen massive shifts – ever-increasing globalization has meant more legal issues and corporate activism, which in turn has generated new challenges and heightened demand. The GC cannot simply act in the role of outsourcer of work to external counsel, as in the past. With the growth of legal departments (it is now not uncommon for legal departments to number in the hundreds or even thousands, often formed of expensive lateral hires) the GC must now wear a number of hats, including that of the “CEO” of their department. The introduction of data analysis into the legal space and the oft-repeated mantra of “less with more” has meant that the GC must now think in terms of spend and budget more than ever before, transforming the legal department from a cost-center to a value-add. They must cultivate a breadth and scope of vision, able to organize and lead their department as an innovator. The flourishing legal ops role also provides yet another challenge for the GC. As the incorporation of legal ops within the law department becomes increasingly essential, the GC must work to ensure alignment and manage change. The present time has been hailed as the golden age of in-house lawyering, yet – and perhaps because of this – it is an uncertain and challenging time for the GC. Tipping Point: Transformation and Innovation in the Legal Department is intended as a handbook for the GC looking to build a truly modern legal department and revolutionize their role. Encompassing aspects from leveraging influence with the c-suite to reimagining organizational hierarchies and seeking the right operational professional, this publication features contributions from those at the frontiers of the profession as it transforms and embraces new areas of expertise. Chapter 4: Legal analytics – why do you need it and how do you build it? We all benefit from the work of few giants who massively changed the world. What sets them apart? Melissa Schilling has written by far the best book on this topic I've ever read, weaving together spellbinding stories about eight amazing mega-innovators with serious, grounded science.Read it and then and give a copy to a friend, and you just might unleash two more world-changers. QUIRKY is a great reminder that when it comes to understanding the extraordinary, outliers and exceptions are invaluable teachers. To be able to break with social expectations, to have the confidence to tackle seemingly intractable problems and to have the social skills to inspire others are unusual, indeed. Schilling’s book takes us on an inspiring journey of discovery—leading us to see clearly what was always there, but hidden in plain view. You’ll finish the book understanding something of true genius. What makes some people so spectacularly innovative, producing triumph after triumph, often in fields in which they have no specialized training? In QUIRKY: The Remarkable Story of the Traits, Foibles, and Genius of Breakthrough Innovators Who Changed the World (PublicAffairs; February 13, 2018), leading innovation expert Melissa A. Schilling delves deeply into the lives of Albert Einstein, Benjamin Franklin, Elon Musk, Dean Kamen, Nikola Tesla, Marie Curie, Thomas Edison, and Steve Jobs to identify the traits and experiences that led them to become serial breakthrough innovators—and might allow us to do the same. Nearly all exhibit very high levels of social detachment that enables them to break with norms. They all have extreme, almost maniacal, faith in their ability to overcome obstacles. They have a passionate idealism that pushes them to work with intensity even in the face of criticism or failure. They exhibit high need for achievement, and derive pleasure from working hard. While these individual traits would be unlikely to work in isolation—being unconventional without having high levels of confidence, effort, and goal directedness might, for example, result in rebellious behavior that does not lead to meaningful innovation—together they can fuel both the ability and drive to pursue what others deem impossible. Schilling concludes by looking at how these insights can be applied to ourselves, our work, our children, and the seemingly intractable problems we face as a society. If we can create more “right place, right time” opportunities for example—by investing in citizen science initiatives (public laboratories), maker spaces, digitization of educational material, and consortiums of expertise that the public can access—we can improve the odds that people from all walks of life will achieve breakthrough innovation, in this generation and those to come. Melissa A. Schilling is the John Herzog Family professor of management and organizations at NYU Stern and one of the world’s leading experts on innovation. Her textbook Strategic Management of Technological Innovation (now in its fifth edition) is the #1 innovation strategy text in the world and is available in seven languages. Schilling is also coauthor of Strategic Management: An Integrated Approach, now in its 12th edition and one of the world's leading strategic management textbooks. She and her work have been featured on NPR's Marketplace, Bloomberg BusinessWeek, Harvard Business Review, Huffington Post, CNBC, Scientific American, and USA Today, among others. She also speaks regularly at national and international conferences as well as corporations on strategy and innovation. Video here. This book is written by a seasoned executive, entrepreneur consultant and educator. It should be read by anyone wanting to improve their decision-making skills. Business contracts are often too long, complex, and hard to understand. Such contracts do not serve the needs of the people who plan, negotiate, and implement them within and across organizations. Contracts seem optimized to win in court and allocate risk after legal problems have arisen, but that is not their only function. Contracts should also help prevent legal problems and secure business opportunities. But to achieve this goal, they must be designed to ensure clear communication and provide information in action-oriented ways. This study explores the novel practice of contract visualization – the use of diagrams, images, and visually structured layouts to make contracts more searchable, readable, and understandable for their day-to-day users, operating in a business-as-usual scenario. it suggests different pathways for organizations to adopt contract visualization practices (pattern libraries, ready-made visual templates, and automated IT solutions). This study illustrates that contract documents do not only have a legal function in case of litigation. They are important managerial and communication tools that can be used strategically to build better business relationships with customers and suppliers. This book will increase your commercial sophistication and better prepare you for analyzing and negotiating warranties. The book creates value by providing: (1) broadly applicable warranty principles; (2) real world examples in the form of actual litigated cases; (3) annotated sample warranty language; and, (4) a comprehensive warranty check list. As noted below, the book has been widely acclaimed by academics and practitioners alike. “A convenient reference tool for business, lay and legal professionals that provides quick insight into the many issues that surround warranties.” - Glenn Clark, Esq. Managing Director, Riker Danzig, Esqs “This is a much needed book at the right time…I’ve recommended [Mr. Humbert’s] books in the past to companies in a variety of industries with good results. I will add this one to my list of recommended resources!” - Michael J. Gravier, Ph.D., C.T.L., Associate Professor of Marketing and Global Supply Chain Management at Bryant University “Another excellent addition to Paul Humbert’s expanding compendium of treatises describing, analyzing and offering insightful guidance.” - Michael J. Beck, Managing Director, M.J. Beck Consulting, LLC “This book will increase your knowledge of warranties and their importance so that you avoid future headaches and supplier relationship problems, while saving you money.” - David Dreyfus, Ph.D., Assistant Professor of Supply Chain Management, Department of Supply Chain Management, Rutgers University When a product disappoints or a service falls short, it is the purchasing and SCM professional who gets the call from the client asking about the warranty. If commercial success and professional self-preservation is an instinct you possess you will master the basic principles and legal tenets applicable to warranties. Use this book to learn about how to analyze, structure, negotiate and manage warranties, while avoiding the pitfalls. It is all well and good to divine brilliant supply-chain strategy with a carefully calculated P&L. however, poorly articulated contractual terms eat “strategy” and well-intentioned “plans” for breakfast. Strategy is nothing without planning, and planning is nothing without a well-written allocation of the parties’ respective rights and responsibilities. Consider this: an architect can give you beautiful plans, but the contract with the contractor is what will define success or failure regarding schedule and budget. Strategy, sound planning, and careful contracting are the tripartite keys to success. Warranty rights and remedies are a big part of achieving that success. Without all three, you are sitting on a two-legged stool. It has been estimated that today, the cost of negotiating the average B2B contract is $16,800. In larger corporations, the annual costs of contract negotiation amount to more than $1.26 billion! On the order of 8.2 billion B2B contracts are signed each year; at least 50% of those require negotiation. Why are those numbers so important? Because research has shown that, on average, 42% of the potential value in negotiated agreements is lost! profit is critical to differentiating the business and its success. both organisations profits through commercial collaboration. In 2014 Mike Robertson left IBM to focus on creating a better way to buy and sell goods and services. The result was the creation of The POD Model. Mike Robertson is CEO of POD Procurement which provides advice and guidance on implementing The POD Model. Mike recently presented The POD Model at IACCM Americas conference 2015. This book is ideal for professionals and students involved in Procurement, Sales and Contract Management across Private Sector, Public Sector and Not for Profit organisations. IACCM members should email Andrew Young, pricing is usually £12.95, but the IACCM discount is 20% so the book is £10.35, plus shipping and handling. This quotation reminds us that contracting and risk are ever present and the better we are at mitigating risk the more successful our contracts will be. What are you doing about mitigating your contracting risks? In August 2015 Cyril published the 4th edition of his 458 page book ‘Manage Your Contracts – A practical start to finish guide for contracting professionals’. This edition is written for intermediate-level contracting professionals, both buy-side and sell-side, and has been designed as a practical guide for use on-the-job. Account: BSB: 033049 Account No. : 490718. If you wish for the book to be sent outside Australia please email Cyril at Cyril@TheRiskDoctor.com.au to enquire about the total cost. "For technology licensing practitioners and students alike, this handbook offers a comprehensive mix of plain-language guidance and tech licensing best practices … Tollen's expert treatment is borne of his experience drafting and negotiating tech agreements in Silicon Valley's virtual trenches." Draft, negotiate, and understand cloud computing agreements, software licenses, and other IT contracts. The Tech Contract Handbook is user-friendly reference manual and training guide on technology agreements. It’s detailed and comprehensive but at the same time uses simple English, like a good contract. It’s the number-one bestseller from the IP Section of the American Bar Association. Attorney David W. Tollen represents buyers and sellers in cloud computing and software licensing agreements and in and other technology transactions. He also provides advice and assistance related to e-commerce, social media, industrial design, and intellectual property. Finally, he provides in-house and public training on drafting and negotiating technology contracts, particularly for contract managers and other businesspeople. He’s the founder of Sycamore Legal, P.C., a technology and intellectual property law firm based in San Francisco. Mr. Tollen graduated with honors from Harvard Law School and has degrees from Cambridge University in England and U.C. Berkeley. In addition to practicing law, he has served as General Counsel of a publicly traded software company and as as Vice President of Business Development for a technology start-up. ABOUT THIS BOOK This book assists the reader and provides value in three ways: First, model contract language in the form of commercial terms and conditions are provided. Second, the contract language is annotated with explanations and suggestions for each of the key articles. Third, summaries of actual litigated cases are provided in synopsis form. This triple combination of language, annotations and key case synopses all work together to instruct and enlighten the reader. What Will This Book Do for You? This book provides a survival manual for anyone involved in the crafting, structuring, negotiating, supporting or managing contracts involving commercial transactions of goods, services or both. It blends the practical with general legal principles and highlights best practices for supply chain professionals and anyone else involved, directly or indirectly, with the generation or management of contracts from cradle-to-grave. Even commercially wise and sophisticated organizations can be untrained and unaware of certain gaps and traps in the management of their contracts. This book addresses those pitfalls and provides lessons learned and guidance that are not typically taught at the college or even graduate school level. Experience can be hard and expensive to come by and this book provides a concentrated dose of experience that immediately raises the reader’s level of sophistication and awareness for gaps and traps while providing practical solutions to pitfalls that can haunt any organization. Left unchecked, these pitfalls can lead to dysfunction and confusion; both of which can be an expensive proposition in today’s competitive and uncertain economic environment. BUILD, EVALUATE OR REDESIGN YOUR SUPPLY CHAIN TRANSACTIONS USING THE PLAYBOOK APPROACH In “PLAYBOOK” the authors apply their decades of experience with procurement, supply chains, contract management and risk mitigation to provide a well-defined methodology for safely and effectively entering into and managing supply chain transactions from “cradle to grave”. There is often a gap between the theory of supply chain management and its actual application in a contracting or commercial context. In “PLAYBOOK”, the authors bridge that gap and provide a clear process for engaging in sound supply chain transactions in a manner best suited to each organization’s unique needs. “PLAYBOOK” offers a disciplined 49 step pathway for building or improving an organization’s supply chain transactions while managing risk and upholding the integrity of the contractual relationship. How well those transactions are entered into, as well as managed, is a critical but often overlooked risk management function. Risk Management for Project Driven Organizations takes readers from concepts to a process model, and then to the application of that customizable model in the user’s unique environment to dramatically improve their risk command and control at the organizational level. A detailed discussion also provides some challenges involved in this process. Effective Complex Project Management demonstrates that for program and project managers to be consistently successful in managing complex projects, they need to include in their project management portfolio of processes an adaptive framework that continuously analyzes and adapts to changing and modifying conditions even to the point of changing project management models mid-project. The author’s adaptive complex project framework is currently the only robust tool to offer an orderly approach to do just that. When applied and managed correctly, this intuitive framework that proceeds from ideation to set-up to execution has proven to deliver on the purpose of programs and projects without fail, in the form of desired business value. How to prepare, negotiate and manage your project contracts easier, better, and faster by unleashing the success factors embedded in one of the world's leading project management methods. Officially licensed by AXELOS Limited, and with a preface by Tim Cummins. In many organizations, procurement has evolved from a tactical, transaction-oriented department into a strategic function responsible for establishing spend management objectives for the entire organization. While the tools they use and the skills they possess have increased overall effectiveness and efficiency, procurement’s internal reputation has not evolved at the same rate. The transformation of the reputation of the procurement function must be directly associated with its ability to generate measurable value. Supply market intelligence (SMI) creation is just such a capability. This book provides procurement professionals with the process, skills, and resources to develop a supply market intelligence program that will deliver value to the organization as a whole. The authors clearly explain each of the concepts introduced and then provide the background and steps required to make execution possible. Part I of the text outlines how to design a supply market intelligence program that meets the needs of the organization while integrating with existing procurement team structures and processes. Part II is a detailed listing of resources available to procurement professionals that will prove to be a trusted guide to a seemingly endless pool of resources and a targeted quick reference for more experienced researchers. Jeanette Jones (MLS) has over 20 years experience providing corporate business and strategic sourcing research services and is the founder of Cottrill Research, a provider of supply market intelligence research services. She has established libraries with research functions for Arthur Andersen and the IT Vendor Management Group at Bank One (JP Morgan Chase) and provided research services for the Strategic Sourcing Group at Wachovia. She has served as an adjunct professor at Ohio Dominican University where she taught a Special Libraries class for the Library and Information Sciences Department. She has also taught research and information literacy skills to students at Collin College and College of Southern Nevada and has authored detailed research guides covering the subject areas of business, supply chain management, and hotel/casino management. She currently maintains the Cottrill Research Blog, which provides news and analysis about the latest research and information resource offerings for procurement professionals. Kelly Barner (MLS) is the Managing Editor of Buyers Meeting Point, an online resource for procurement and purchasing professionals, and has over a decade of experience working in procurement and supply chain. Her unique perspective on supply management is based on her time as a practitioner, a consultant at a solution provider, and now as an independent thought leader. Ms. Barner is a popular and regular guest content contributor to publications and blogs such as Procurement Insights, the American Purchasing Society Journal, the eSourcing Forum, and ThomasNet’s IMT Procurement Journal. Since 2011 she has delivered a weekly procurement Internet radio update that covers the coming week’s events and a guest soundbite with editorial commentary. Ms. Barner has her MBA from Babson College, an MS in Library and Information Science from Simmons College, and a BA in English and History from Clark University. In 2012, 2013 and 2014 she was awarded a Provider ‘Pro to Know’ designation by Supply & Demand Chain Executive Magazine, and in 2013 she was also recognized as one of 28 'Top Female Supply Chain Executives'. Going Beyond the Waterfall explains how to define scope at the outset of a project; provides a solid model for predicting and managing solution scope across a project life cycle where the decisions and actions of every team member contribute to that evolutionary process; identifies the impacts that key tasks and activities will have on scope and how each can be managed effectively to prevent unnecessary scope creep and reduce run-away projects. This book is the definitive guide to leveraging the external services market for business advantage. Based on 30 years of research into over 2100 organizations and advisory engagements throughout Europe, the Americas, Asia Pacific and Africa, three world authorities detail the frameworks, lessons and practices that inexorably produce high performance. They pinpoint the who, where, and how of leadership, establish the strategic agenda and configure the outsourcing arrangement, how to manage across the outsourcing lifecycle, the vital client and supplier capabilities needed, how partnering evolves, and its real attributes, how clients innovate through outsourcing, and how they harness offshoring effectively. Up to date, with on-line follow-on materials to address market changes, this book provides the most authoritative single-source handbook for practitioners who want to be at the top of their game. Todos negociamos de manera diaria. Negociamos con nuestras esposas, hijos, padres y amigos. Negociamos cuando alquilamos un departamento, compramos un coche o aplicamos a un puesto de trabajo. Tu habilidad para negociar debería ser el factor más importante en tu carrera. Traducción al español por Pablo Cilotta, quien lidera la IACCM en países de habla hispana pcilotta@iaccm.com. A new book on how intelligent use of contracts can help you sell more and deliver better! In this straightforward and highly practical look at how contracts are used in everyday business life, Tiffany Kemp shows us how to use contracts to help us build stronger, more profitable relationships with our customers. If you’ve ever wondered why the lawyers object to you offering clients your ‘best endeavours’, or why ‘time is of the essence’ means more than just ‘get a move on!’, you’ll find this book an invaluable and very readable companion to your commercial negotiations. And if you’ve always considered legal and commercial to be the ‘Sales Prevention Squad’, you’ll learn how they can become your greatest allies in closing and delivering profitable deals. Savvy managers no longer look at contracting processes and documents reactively but use them proactively to reach their business goals and minimize their risks. To succeed, these managers need a framework and A Short Guide to Contract Risk provides this. The foundation of identifying and managing contract risk is what the authors call Contract Literacy: a set of skills relevant for all who deal with contracts in their everyday business environment, ranging from general managers and CEOs to sales, procurement and project professionals and risk managers. Contracts play a major role in business success. Contracts govern companies' deals and relationships with their suppliers and customers. They impact future rights, cash flows, costs, earnings, and risks. A company's contract portfolio may be subject to greater losses than anyone realizes. Still the greatest risk in business is not taking any risks. Equipped with the concepts described in this book, business and risk managers can start to see contracts differently and to use them to find and achieve the right balance for business success and problem prevention. 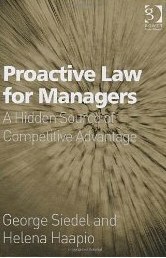 What makes this short guide from the authors of the acclaimed Proactive Law for Managers especially valuable, if not unique, is its down-to-earth managerial/legal approach. Using lean contracting, visualization and the tools introduced in this book, managers and lawyers can achieve legally sound contracts that function as managerial tools for well thought-out, realistic risk allocation in business deals and relationships. About the Author: Helena Haapio works as International Contract Counsel for Lexpert Ltd. Completing legal studies in Finland, and at Cambridge University, Haapio served for several years as in-house Counsel in Europe and the USA. She has designed and conducted training workshops around the world, acts as arbitrator in cross-border contract disputes and undertakes multi-disciplinary research on ways to enhance contract usability and communication. George J. Siedel is Williamson Family Professor of Business Administration and Thurnau Professor of Business Law at the University of Michigan. He has served as a Visiting Professor at Stanford, Harvard and the University of Sydney. After legal studies at the University of Michigan and Cambridge University, Siedel worked in a professional corporation as a corporate attorney. Haapio and Siedel are the award-winning authors of Proactive Law for Managers. They are active members of professional bodies including the International Association for Contract & Commercial Management. Make a note of the discount code: [G1DBF35]. G1DBF35] in the box marked Promotional Code in Step 1 of the basket. Press the Update Basket button and you will see the discount applied to this title in your basket. Proceed through steps 2-4 to confirm your order. Add the book to your basket. Proceed through steps 2-3 to confirm your order. Companies, lawyers, privacy officers, developers, marketing and IT professionals face privacy issues more and more frequently. Much information is freely available, but it can be difficult to get a grasp on a problem quickly, without getting lost in details and advocacy. This is where Determann's Field Guide to International Data Privacy Law Compliance comes into its own - helping to identify issues and provide concise practical guidance in an increasingly complex field shaped by rapid change in international laws, technology and society. Determann's Field Guide to International Data Privacy Law Compliance is published by Edward Elgar Publishing Inc. In the ever-changing world of business, we've arrived at a point where process has trumped culture, where the race toward efficiency has made us complacent and unable to reach our potential. Stuck in the land of status quo, we've forgotten how to think. And the very structures put in place to help businesses grow are now holding them back. It's time to Kill the Company. What this book suggests is simple: to SIMPLIFY by getting rid of things first rather than continually building on what doesn’t work; a form of spring cleaning for your organization. Innovation specialist Lisa Bodell urges companies to question assumptions and to challenge rules that have outlived their time. Killing these status quo attitudes makes space for change and more value-added work, like thinking. Bodell tells us that these changes need not be one-size-fits-all initiatives that are forced upon employees. Instead, we need to embrace smaller, positive behavioral changes that create ripple effects throughout the organization. Too many change initiatives simply add another layer of processes to the to-do lists of already overwhelmed and tired employees. Not this one. Innovation is supposed to make things better, not worse, easier, not more complicated. Kill the Company is your guide for simplifying and streamlining, then building and maintaining a place where everyone’s innovative spirit and energy fuel the long-term goals of your organization. A company that empowers its people to think critically, question relentlessly, and act boldly, to move from Zombies, Inc. to Think, Inc., will own the future. This title is the sister book to the global best-seller Metrics for Service Management. Taking the basics steps described there, this new title describes the context within the ITIL 2011 Lifecycle approach. More than that it looks at the overall goal of metrics which is to achieve Value. The overall delivery of Business Value is driven by Corporate Strategy and Governance, from which Requirements are developed and Risks identified. These Requirements drive the design of Services, Processes and Metrics. Metrics are designed and metrics enable design as well as governing the delivery of value through the whole lifecycle. Fearless Negotiating: Negotiation is the crux of every crucial exchange. With humorous insight, Michael Donaldson shares the negotiation secrets that have made him one of the entertainment industry's most sought-after lawyers and a respected consultant and leader among independent filmmakers and actors. He shows how to set goals (the Wish), push for results (the Want), and draw the line (the Walk)-and to cast aside the stresses and difficulties of the negotiation process. Securing a place at that table will require women not only to master all of the essential negotiating skills, but also to be comfortable with being negotiators. But how can you learn these invaluable lessons when most negotiating books are written for men, whose instincts are to confront and overpower, focusing almost exclusively on outcomes? Women approach negotiating very differently, and A Woman's Guide to Successful Negotiating is the practical, easy-to-use guide that will show you how to use your own style to get what you want--without giving up who you are. The business world turns on the art of the deal. And with Negotiate Your Way to Success, you'll master 24 powerful strategies designed to help you conduct negotiations of any type. This easy-to-read guide delivers step-by-step instruction on identifying and working with each negotiator's “hot button” issues, to ensure the process and the result satisfy all parties. You'll advance your own position and accomplish organizational goals in an atmosphere of productivity - not confrontation. Communicate best when it matters most! The definitive guide to clear, purpose-driven communication—revised and updated with new insights and powerful techniques. The classic guide to conversing in high-impact situations, Crucial Conversations helps you get constructive results when emotions run high and opinions vary, in the workplace and beyond. For more than three decades, The Supply Management Handbook (formerly The Purchasing Handbook) by Joseph Cavinato has been vital for purchasing and supply professionals in every field and industry. This latest edition comprehensively updates and revises this classic to encompass the ongoing shift from simple purchasing to a new, more technology-based imperative--identifying and managing supply chain sources and strategies. Addressing every essential issue from outsourcing to total cost of ownership to negotiations and contract management, an international team of supply management experts offers the authoritative, practical coverage you need to survive and thrive in today's ever-changing supply management environment. Manufacturing Planning and Control for Supply Chain Management: APICS/CPIM Certification Editionby Jacobs, et. al. is the definitive guide to manufacturing planning and control-fully revised and updated for the CPIM Exam. Improve supply chain effectiveness, productivity, customer satisfaction, and profitability with help from this resource. Completely up-to-date, the book offers comprehensive preparation for the challenging CPIM exam with hundreds of practice exam questions and detailed case studies. In-depth coverage of manufacturing planning and control (MPC) best practices and the latest research gives you the competitive advantage in today's global manufacturing environment, and helps you to obtain the coveted CPIM designation. Written for purchasing managers, Proactive Purchasing in the Supply Chain by David N. Burt, Sheila D. Petcavage, and Richard L. Pinkerton reveals how to use the latest and best procurement practices to help any organization maximize the effectiveness and efficiency of its supply chain. The ability of purchasing to dramatically increase return on investment, reduce costs, improve quality, and shorten time to market is highlighted throughout this practical guide. Essential topics such as legal issues, green purchasing, negotiation, ethics, price-cost analysis, production-inventory control, purchasing risk management, sourcing, and demand-logistics management are addressed. Real-world case studies in each chapter demonstrate the strategies presented in the book. A detailed planning model for implementing these world-class procurement methods is also contained in this definitive resource. In Strategic Lean Mapping continuous improvement expert Steven Borris reveals how to visually document an organization's processes and identify problematic issues. He illustrates how to blend and then apply select techniques from Lean Manufacturing, Theory of Constraints, RCM (Reliability-Centered Maintenance), TPM (Total Productive Maintenance), OEE (Overall Equipment Efficiency), and other methodologies to implement the perfect solution to the task at hand. Diagrams, charts, and real-world case studies help put the concepts presented into practice. When running your own business, it can be easy to believe that contracts can wait. But getting the best (or avoiding the worst) from contracts is often a major factor in how well and how quickly a business succeeds. This book, from legal expert and entrepreneur Charles Boundy, provides business owners and managers with everything they need to stay on top of contracts and avoid getting bogged down in legalese. - what to do (and not do) if things go wrong. A focused guide for the time-pressed, this is an indispensable tool for all businesses. Read it and stay successfully on top of the many contractual issues that businesses face every week. what to do (and not do) if things go wrong. This practical guide reveals how to identify and eliminate waste in your organization's supply chain and logistics function. Lean Supply Chain and Logistics Management provides explanations of both basic and advanced Lean tools, as well as specific Lean implementation opportunities. The book then describes a Lean implementation methodology with critical success factors. Real-world examples and case studies demonstrate how to effectively use this powerful strategy to realize significant, long-term improvements and bottom-line savings. Expert Strategies for Improving Supply Chain and Logistics Performance Using Lean. This practical guide reveals how to identify and eliminate waste in your organization's supply chain and logistics function. Lean Supply Chain and Logistics Management provides explanations of both basic and advanced Lean tools, as well as specific Lean implementation opportunities. The book then describes a Lean implementation methodology with critical success factors. Real-world examples and case studies demonstrate how to effectively use this powerful strategy to realize significant, long-term improvements and bottom-line savings. In their second book Gibbs and Humphries look at how the need for constant organisational improvements and the increase in partnering come together in what they describe as Collaborative Change. This book describes the underlying concepts and models that can be applied, and critically draws heavily on personal experience to shed light on how effective change can be executed through high performing partnerships. This 'experience' is related in many case topical studies which include war-fighting in Iraq, team management on a husky sledge and operating global, virtual teams in the British Civil Service. IACCM Members are eligible for a 15% discount - follow the link below and enter code HL2XSGZX for the discounted rate. This comprehensive guide takes you all the way from general strategies and principles - Latz's Five Golden Rules of Negotiation - to specific tips, techniques and even phrases you can use at the table. Companies such as Microsoft, Intel, UPS, and P&G are embracing Vested Outsourcing. How do you craft a Vested Outsourcing agreement based on the Five Rules? Is there a template or roadmap you can give me for guidance and success? This manual is your resource to answer those questions and help you create Vested agreements. In The Vested Outsourcing Manual, Kate Vitasek and her co-authors have taken the Five Rules of Vested Outsourcing and developed the roadmap to creating a Vested Agreement through which each party has a vested interest in mutually-defined and desired outcomes. If money is the lifeblood of business, contracts are the arteries that help carry it around the commercial body. Anyone in business is liable to have to deal with business contracts, but few are trained to do so. Even those that are trained may have experience in limited areas or in the distant past. But the right contract can make a vital difference, not just to recording and enforcing, if need be, the contract terms, but also in ensuring the agreement deals with the real issues and approaches them in a practical way. Finding help in this area is not easy, as the market tends to offer little between serious academic tomes on the one hand and student summaries geared to exams on the other. "Business Contracts Handbook" fills that gap, covering both the basics of contract law in an accessible style and using a thoroughly practical approach to understanding and negotiating the key terms in a business contract. If you have little prior knowledge, Charles Boundy's many years of experience in drafting and providing guidance on business agreements of all kinds will enable you to acquire a working background quickly. If you have years of experience you will still benefit from a checklist, a reminder of what is important and why, and an easy reference to up-to-date language and drafting - there is always more to learn. Nice guys don't have to finish last! Research reveals that more than 60 percent of managers and workers feel that they are 'too nice' in the workplace. While this may not sound like a serious problem, Nice Guy Syndrome is a destructive disorder that, if left unchecked, can derail any organization. Nice guys are everywhere and do not fit neatly into any one category. They are men and women of all ages, races, education and income levels, with two things in common: a strong tendency to be overly nice combined with the ongoing frustration they experience when their niceness gets in the way of their business success. The founders of Nice Guy Strategies teach that nice is not about being weak or soft. You can hang on to your morals, compassion, and sincerity and still get ahead. However, obtaining the necessary knowledge and skills it is easy to overcorrect and take on some of the behaviors of JERKS. The good news is that the challenges faced by nice guys are surmountable. With a little guidance, they can learn to stick up for themselves, be more effective, and achieve more success. Based on hundreds of interviews, Nice Guys Can Get the Corner Office gives the insights and stories from both ordinary nice guys and celebrity executives who have overcome their own Nice Guy Syndrome, such as Herb Kelleher of Southwestern Airlines, John Pepper of Disney and Procter & Gamble, Jon Luther of Dunkin' Brands, Sam DiPiazza of PricewaterhouseCoopers, and many more. Whether you are male or female, white collar or blue collar, young or old, it's not easy to find a balance between too nice and not nice enough. Use the tools and secrets in this book to become the nice guy in the corner office. Part of the SMARTnership(TM) Negotiation Series, this eBook focuses on the fundamental communication skills that every business professional needs to succeed. Whether you are meeting with prospective clients, working on a project team with coworkers, negotiating contract terms, or simply conversing over the water-cooler you need to be able to get your thoughts across and make a meaningful connection with your listener. This book shows you how to position yourself for success so that you get what you want out of your professional relationships. This eBook shows you how to optimize the clarity and impact of your communication by creating congruency in your words, your tone, and your body language and then adjusting your delivery or your content to accommodate the listener’s preferred method of receiving information. By customizing what you are saying to the other person’s preferred style, you can quickly build rapport, establish trust and credibility, and enhance the clarity and persuasive value of your message. This eBook, part of the SMARTnership(TM) Negotiation Series, offers business people a refresher course on the basic skills of presenting from the podium. In the 21st century corporate climate presentation skills can make or break a career. Whether you are currently in a cubicle or the Board room, you must be able to communicate your ideas and make an emotional connection standing before a group of co-workers, prospects, financiers, or vendor partners. This eBook will enable you to give strong, effective, and impactful presentations so that you are getting the recognition you deserve and the results you want. Preventive Law and Problem Solving: Lawyering for the Future is designed for four audiences. First, it introduces a broad, socially connected understanding of legal systems and legal thinking to students who are considering, or just beginning, law study. Second, for those who have completed their first year of training, the book reflects on the assumptions that underpin the legal methods they have been struggling to master. Third, for those interested in legal theory, the book describes and explains a new paradigm for legal thought. Finally, practicing lawyers are offered examples of using the preventive/ problem solving approach in contract formation, project management, general business representation, domestic violence, and health care delivery. Building on the author's long-standing interest in the complex relationships between problems and the procedures employed for their resolution, the book explores: how legal problems may be prevented; how lawyers may proactively assist clients in identifying and reaching their goals; the impacts of legal methods on the people involved in a dispute; and how law can be understood as one part of an elaborately intertwined system comprised of the problems that people bring to law; the methods available to address those problems; the skills that lawyers must employ to use those procedures effectively; the ethics with which they are expected to operate those procedures; the vision of truth that propels the system; and the broader human culture within which law, lawyers, and legal methods are shaped. About the author: Thomas D. Barton is the Louis and Hermione Brown Professor of Law at California Western School of Law in San Diego. He obtained his J.D. degree from Cornell Law School, and a Ph.D. in Law from Cambridge University, where he researched problem solving within common law adjudication. Professor Barton teaches courses in problem solving and prevention, Civil Procedure, Contracts, and various topics in law and society for undergraduates. He writes and speaks primarily on legal theory and Preventive Law, and coordinates the National Center for Preventive Law, found at www.preventivelawyer.com. Not your average business self-help book, Impact! is a 'total person' development guide that says 'who you are impacts everything you do'. It doesn't focus on what's wrong with you but rather what's right with you so that you can turn your potential into performance. The secret to success and fulfillment-both professionally and personally-is that you should stop trying to 'fit in' and become what others want you to be; that you can become more productive, powerful, and passionate by becoming more of who you were meant to be instead. Why? Because no longer is there any separation between who you are and what you do! With step-by-step strategies and smart insight, you will learn how to have significant positive impact in your life and in your career; you'll learn how to unlock your personal power; live your life with purpose; appreciate your family; identify your greatest gifts and talents; value your failures and learn from them; stand up for yourself; give yourself permission to stand out; and start to ask for what you want. Best of all, you will learn how to be seen, heard and celebrated for being authentic - for being exactly who you are. The key to Impact! lies in knowing yourself intimately, leading your life from the inside out, and using your strengths to become happier and more fulfilled. Impact! shows you who you are, where you're going and how to get there. It also helps you to get out of your own way! Gain a thorough understanding of the critical role of purchasing in the supply chain with one of today's leading-edge strategy and purchasing books--PURCHASING AND SUPPLY CHAIN MANAGEMENT, 5E. This turnkey solution provides current and complete coverage that makes it not only a useful book, but also a valuable professional reference tool. This edition presents the most recent critical developments in the field as well as the impact of the recent recession and ongoing business uncertainty on today's supply chain. This leading author team draws from firsthand experience and their relationships with executives and practitioners worldwide to present numerous cases, memorable examples, and unique insights that enable readers to better understand today's purchasing process. Dr. Robert M. Monczka is Director, Strategic Sourcing and Supply Chain Strategy Research, The Center for Advanced Purchasing Studies (CAPS); Distinguished Research Professor of Supply Chain Management, The College of Business at Arizona State University(ASU) and a National Association of Purchasing Management (NAPM) Professor at ASU. Robert Handfield is the Bank of America University Distinguished Professor of Supply Chain Management, and the Director of the Supply Chain Resource Cooperate at North Carolina State University's Poole College of Management. Savvy managers no longer look at contracts and the law reactively but use them proactively to reduce their costs, minimize their risks, collaborate to innovate, protect intellectual property, and create value for their customers that is superior to the value offered by competitors. But to achieve competitive advantage managers need a plan. Proactive Law for Managers provides this plan. Equipped with the concepts in the book, managers can innovate in areas that are often neglected - and implement their ideas in a profitable manner. George Siedel and Helena Haapio first discuss the traditional, reactive approach used by many managers when confronted with the law then contrast it with a proactive approach that enables the law and your legal capabilities to be used to prevent problems, promote successful business, and achieve competitive advantage. "Proactive Law for Managers" deals with contracts and contracting, showing their profound impact on business strategy and how you as a manager can design your contracts and contracting processes so that they promote business success and prevent problems. The authors apply four steps to legal issues that relate to various stakeholders. Along with a focus on product liability, including hidden new product opportunities represented by this area of the law, they show how the Manager's Legal Plan enables you to secure access to key talent while avoiding employment pitfalls, how to deal with government regulations, and how intangible assets and intellectual property can be used to seize strategic control of innovations and sustainable strategic advantage. Given the importance of the law to the success of your company shouldn't you be reading Proactive Law for Managers?